When there is a lot of work, and too many things to remember, a task management tool is always handy. You can use it for work or on professional work if it offers collaboration feature. 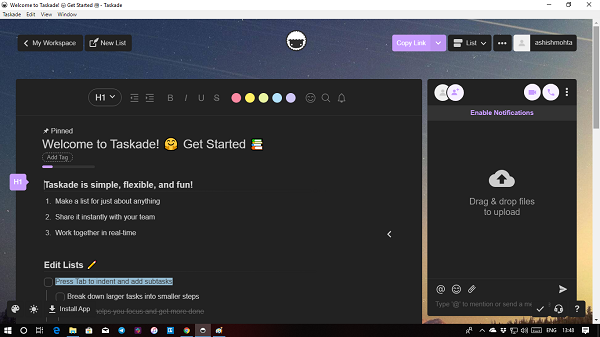 Today we are taking a look at Taskade, a powerful online task management tool, which also offers applications, for tasks, notes, and communication. Taskade seems to have included a lot of features which usually go missing in many Task management applications. The ability to switch immediately between List view, Board View and Acton view is incredible. It doesn’t limit you to stick with one style, and this flexibility is one of its core strength. Every view has its strength and weakness. If you choose the Board view, you will have to scroll to the left or right to find all the tasks. Action View is impressive because you get quick access to Due Dates, Comments, etc. right on the screen. One small drawback which I had noticed is that† the views don’t sync. If you open it in the browser, it defaults to the list view even if I had action view in the desktop application. Then comes tags and template. The later is particularly useful when you need to repeat the same set of tasks every day, i.e., Workflows. While we all know that tags help to organize, Templates is where you create all basic stuff, and apply to the new list. A classic example is where a meeting will always have a set of agendas and action items. Just use the template, and add anything specific to that task, and you are ready. If you have a project or list of tasks and list which can be used as a template, save it as one. Modify to remove all essential details, and then reuse it anytime. In Pro account, you also get access to predefined templates made for business. It includes Weekly Tasks, Brainstorming, Team Review, Project Roadmap and more. To use these, you will have to visit the template section, and then apply it. 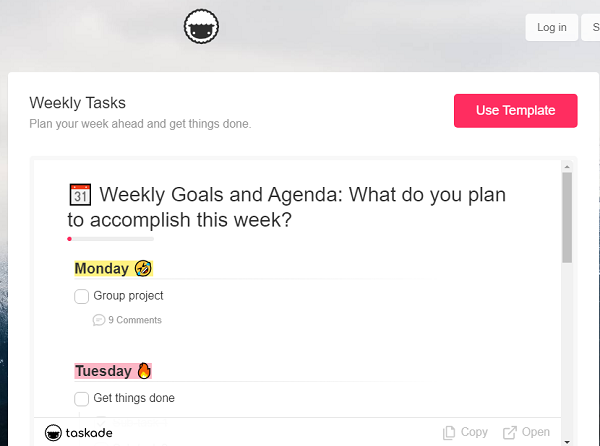 If you always felt the task management apps had been very serious, Taskade will change your views. More than impressive, I think its more of happy design. The icons and mix of emojis will make anybody smile. It also offers Video and voice call conferences if your team work from different regions. If you have a problem with hearing, you can change the voice quality. In case you would like to refer back, you can choose to record the meeting, and upload it to Dropbox. Real-time collaboration with #hastag and @mentions. 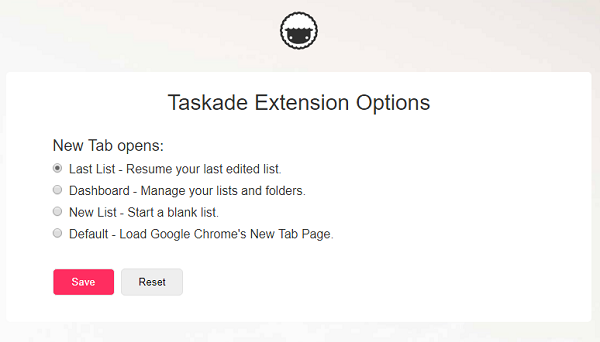 If you need a vast nested list, Taskade can take you a long way. Add tasks as favorites to access them quicker. Notifications can be configured. You can choose them for the browser, mobile, desktop applications, etc. Click to edit any task. 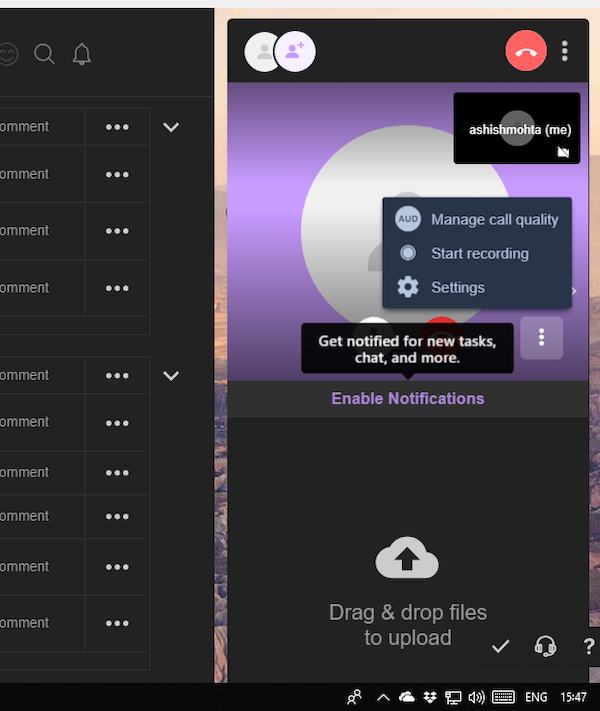 The app supports Light, and Dark theme, custom background and more. When using this application, you can use keyboard shortcuts to complete a task, indent, delete and so on. Last List – Resume your recent edited list. 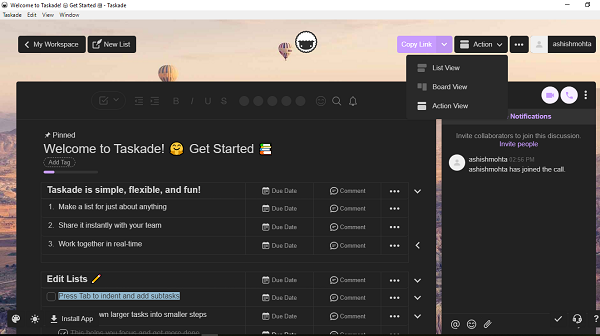 Dashboard – Manage your lists and folders. New List – Start a blank list. Default – Load Google Chrome’s New Tab Page. It is handy when you are using Taskade to manage all your tasks. You can quickly add a new list or look at the last list. Also when you are using with a team, and a lot of tasks are synced, it comes in handy to take a look at them quickly. However, It will replace Chrome’s default new tab which can be annoying. So choose wisely. I would highly recommend you to use the desktop application. It’s because you can manage it separately from everything else. The desktop app offers the same experience and features as the web version with notifications support. Lastly, the service offers its applications on Android, iOS, MacOS as well. If you want to keep using an extension, you also get the Firefox extension along with Chrome. It supports real-time syncing, push-notifications and collaboration across all devices. If you are up for some serious work, and collaboration, you can get a year subscription0 Taskade at $7/mo. The best part is that if your team joins in a workspace with you, they will have the same benefit as your Pro account for free. Also, their referral program grants up to 12 free months of Pro for users that join using your invite link. No credit cards required. What do you think of Taskade? Do you think its better than your task management app? Let us know in the comments.